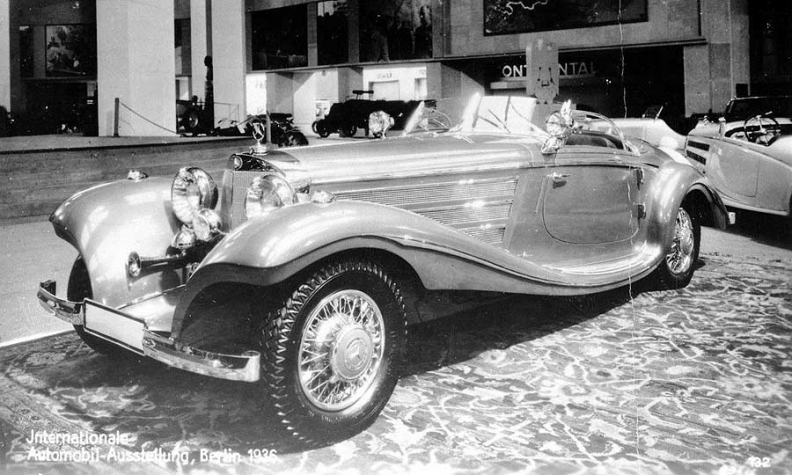 A Mercedes-Benz 500K "Spezial Roadster" is shown in this undated photo. One of these classic cars, amongst the most expensive models of their era, was taken by U.S. troops from its German owner at the end of World War II and is now the subject of a court claim by his daughter. BERLIN (Bloomberg) -- A court in Hamburg ruled this week that the grandchildren of a German industrialist have a valid claim to a classic Mercedes car worth about $4 million that was taken by U.S. soldiers during World War II. Hans Prym, the owner of a manufacturer of buttons, zips and other clothing fasteners that is still in the possession of his family today, kept the car in Stolberg, a suburb of Aachen close to the Belgian border. Known locally as the "Zipper King," he purchased the car -- one of the most expensive models available at that time -- in 1935. In an initial ruling, the Hamburg regional court said yesterday there was no evidence that U.S. troops quartered at Prym's Stolberg estate, Waldfriede, in 1945 were entitled to take the car, a Mercedes-Benz 500K "Spezial Roadster." A Dutch classic car collector called Frans van Haren paid $3.8 million for it last year at RM Auctions in Monterey, Calif. When he offered it for sale in March this year at Techno Classica, a car show in the German city of Essen, it was impounded under court order. "The court has recognized our claim is valid and we will prepare the next stage and file suit for the car's return," said Alexander Martius, the lawyer who represented the heirs in court. "We think the decision is right and it's an important step toward restitution. I am extraordinarily happy for the Prym family." The car may be one of only 29 of its type left and is still in immaculate condition, according to Martius. RM Auctions said in its sale note that the car's history from Prym's purchase until the 1970s was unknown. It described the Mercedes as "magnificently designed, fastidiously constructed and assiduously maintained by a succession of owners." At the end of World War II, many valuables found their way to the U.S., taken as trophies and souvenirs by troops when they left Germany. Some have since been returned. In a New York court decision in 2009, for instance, a collector was forced to return a 16th-century book worth $600,000 to a museum in Stuttgart, more than six decades after it was stolen by a U.S. army captain. Prym's Mercedes disappeared in 1945, while he was serving a prison sentence handed to him by the Allies. His estate was used as a base for U.S. troops serving under General Maurice Rose at the beginning of the march into Germany. Stolberg was one of the first places in Germany to be conquered. The caretaker who looked after Prym's car, Franz Wagemann, was away for a few days when it vanished. His daughter, who is now 84 and lives in the U.S., recalled her father's reaction in a statement presented to the court. He was, she wrote, "furious" and "very dismayed." The court said that the statute of limitations has not yet expired on the theft, because the 30-year period under German law is only applicable for the time the car has been in Germany. In the U.S., the statute of limitations runs only from the time of discovery of its location.